The planet Jupiter is always one of the brightest objects in the night sky. It’s brighter than any star, and is only outshone by the planet Venus and the Moon, and, very rarely, by Mars and Mercury. Jupiter reaches a position for optimum viewing in a telescope once every 13 months, roughly, and it makes its latest closest approach to Earth on May 9, 2018 when the planet appears in the constellation Libra along the southern ecliptic. A couple of months before and after this date, Jupiter is in perfect position for viewing with a small telescope, or even a pair of binoculars. You can’t miss it: the planet is by far the brightest object in the southeastern sky. The visible face of Jupiter reveals so many interesting features in a small telescope that the planet is a favorite target for new and experienced stargazers. Jupiter on May 9, 2018 lies opposite the Sun in the constellation Libra. The planet stays in Libra through mid-2018, then moves eastward into Scorpius. At its closest approach to Earth, the planet’s disc spans nearly 50” (arcseconds), large enough to see well in a telescope. Only Venus, which is much closer, occasionally appears larger from Earth. But unlike featureless Venus, Jupiter reveals an enormous amount of detail. The best telescope for seeing Jupiter is, of course, the one you have right now. 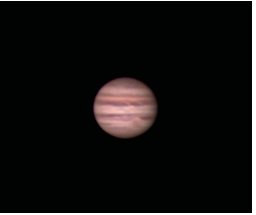 But here are a few tips to get the most out of your optics and your situation when looking at Jupiter. First, you need to pick the right time to see Jupiter, namely, when Earth is closest to the planet. That time is when Jupiter is at opposition, when it is opposite the Sun in the sky. At opposition, the planet rises in the east as the Sun sets in the west. But Jupiter is large enough to look good for a few months on either side of opposition, so there’s still plenty to see. Next, you need a night with good steady seeing. You can tell if the air is steady and the “seeing” is good if stars exhibit very little twinkling. If the air is turbulent, even a big telescope will show Jupiter as a boiling featureless blob. Generally, to see the planets, you want a telescope with a long focal length to give you a larger image for a given eyepiece. Refracting telescopes are often best because they have an unobstructed view and so provide the best image contrast. Larger aperture gives more resolution of fine detail, assuming your sky conditions allow it. Newtonian telescopes work fine as well, but if you use a Newtonian reflector telescope, make sure it is well collimated. The four largest moons of Jupiter remain are a delight to watch as they change position constantly in their continuous Newtonian dance with the big planet. The moons of Jupiter make for ideal viewing for all stargazers, especially kids or near-beginners with binoculars or a small telescope. Astronomers refer to Jupiter’s four largest moons as the Galilean satellites, since they were first observed by the great Galileo in 1609. Each of Jupiter’s moons is a distinct world in its own right, and each is influenced by its proximity to Jupiter itself. The moons of Jupiter as imaged by NASA spacecraft. From left: Io, Europa, Ganymede, and Callisto. Io, a red-orange sulphuric hell-hole of a world, where volcanos spray molten lava high into space. Io shouldn’t have a molten core– it’s too small– but the gravitational push and pull of Jupiter kneads the core of this small world, and keeps it perpetually active. Europa is slightly smaller than our Moon, but it’s much lighter. The surface is smooth and free of craters, but long cracks criss-cross the surface. Fly-bys of NASA satellites suggest Europa has a liquid-water ocean miles under its icy surface, and some planetary scientists think the moon’s hot core may furnish enough energy and minerals to stimulate the formation of simple life forms. Ganymede also has a smooth, glassy surface with patches of older, cratered material. The moon is the largest in the solar system, outsizing even the planet Mercury and dwarf planet Pluto. The geology of this moon is not well understood. Callisto, the most distant of the four moons, is geologically dead as a doornail. Like Mercury and our own Moon, its surface is strewn with craters, which means not much has happened here since the early days of the solar system. You can clearly see the moons of Jupiter move over the course of an hour or less. It’s great fun to track them during an evening, especially when the moons pass in front or behind Jupiter, or when they cast a shadow on the big planet. The above link also gives times of such events. At 100x or more, you can resolve the discs of each of the moons, which are all brighter than 5th magnitude and would be visible without optics if not for the glare of Jupiter. With large, high-quality telescopes and dead-steady seeing, some amateurs have even reported seeing markings on the moons!